Not too sure of the species name with this bird. I'm normally NOT big on flash photography. But in certain circumstances I thought this shot, as well as a few I shot inside the brand new McNeil Avian Center at the Philadelphia Zoo warranted it. I'm also now shooting in RAW mode since Corel Paint Photo Shop Ultimate X2 FINALLY upgraded to recognize Canon Rebel XSi RAW convert formatting. 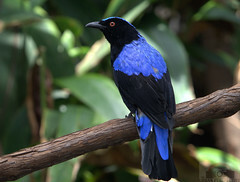 It's mostly natural lighting within the McNeil Avian Center, located within the Philadelphia Zoo.